Well, my chickadees, I can now say that I'm actually totally caught up on watching Orphan Black. We shall have to see if that translates into being caught up on recapping the show, but for now, know that I am giving it my most valiant effort and that I appreciate your grace in all of this. Not that you really have much choice in the matter, but still. It's the thought that counts. 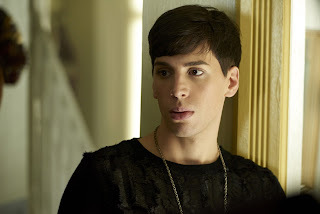 So last week on Orphan Black we left off with a couple of pretty intense situations: Sarah was going to be either killed or kidnapped by the Castor clones (say that five times fast) and Gracie had a miscarriage then found herself cast out of the Prolethean community because her mom is the worst. Seriously, on a show where everyone has some sort of damage, Bonnie Johanssen is the absolute worst. This week we follow the outcome of all of those situations, as well as checking in on our b-plots, with Cosima and Alison sort of treading water in their clearly not very plot relevant at the moment lives. Sarah, we learn, has been taken captive by Castor and now occupies the cell right next to Helena. Gracie stumbles to Art's doorstep in lieu of anywhere else to go. Cosima goes on a date. Alison isn't in this episode but presumably she and Donnie are offscreen selling drugs. And Felix facepalms at literally everyone. The first storyline is obviously the biggest: Castor now has possession of both Sarah and Helena, which is a huge score for them and a terrible situation for Leda. I mean, with Sarah now trapped alongside her sister, who's going to rescue them? Dr. Coady now has the original DNA that was used in the Johanssen baby, but she's keeping Sarah and Helena around as a backup plan in case this doesn't work. Paul, who is now back from Arlington, is furious about this. He made the deal, after all, to keep Sarah safe. Safe really doesn't mean in the clutches of a paramilitary organization that is rapidly going off the rails. He makes Dr. Coady promise not to hurt her, but that doesn't really do much to endear Sarah to Helena, who blames Sarah for her imprisonment. And yeah, that's the other super harsh part of this episode. With Pupok whispering rude scorpion things in her ear, Helena is completely convinced that Sarah is the one who sold her out. She is done with her sister, just as Sarah is becoming more and more invested in their relationship. Since we the audience have been watching Sarah move mountains to find Helena this season, it's just brutal. Still, after a few heart to hearts and some yelling, Sarah manages to convince Helena that it wasn't her fault and that they can work together to escape. Their plan uses a lot of ingenuity and involves a weird amount of butter, but eventually Helena manages to wriggle out of her cell, disable the camera, kill a guard, and...leave Sarah there to rot. Like I said, it's brutal, but when push comes to shove, Helena just doesn't believe that her sister really wants to save her. The worst part is that we can easily see why she doesn't trust Sarah. Up until this point, their relationship has been entirely one-sided. Yes, Sarah has spent all season looking for Helena, but Helena didn't see that. She has to take it on faith, and based on what she's seen until now, it doesn't sound at all true. Remember that Sarah shot her at the end of season one, spent season two ditching her and then finding her again whenever Helena was conveniently needed, and literally using her. Hell, Sarah abandoned Helena in police custody once and didn't even come back to look for her. So while it's really difficult to think about, I don't blame Helena for leaving her sister behind. Helena is feral, a kicked dog of a woman, and she is pregnant. She's got to think about her baby. Yes, we know that Sarah would go to hell and back for Helena and her child now, but Helena doesn't. She made the choice that worked best for her given the information she had, and we have to respect that. Also she parkours her way out of the compound, and it's super impressive. As TDOOB pointed out, maybe Castor shouldn't dress their illegal prisoners in such camouflaged clothing. All of this, though, leaves Sarah stuck in the Castor prison with her clone brothers, Paul, and the mysterious but definitely evil Dr. Coady. Might I go so far as to say that this is bad? I might. Anyway, back in civilization, Gracie has found her way from wherever that sketchy Prolethean farm was to Toronto and directly to the door of one Detective Art Bell. How she found him I have no idea, nor do I have any idea how she got there, but I'm guessing that's not important. Maybe Art passes out cards with his home address on them that say "Are you a curly-haired lunatic escaping from a religious cult? Come to Art for help!" Seems legit. Art figures that he has neither the time nor the inclination to help Gracie acclimate to society, so he brings her to the only people he can think of who might be able to even grasp the situation: Mrs. S and Felix. Which is a weird moment but at the same time completely reasonable. Art and Mrs. S don't get along, but he respects the hell out of her, and he knows that Felix is trustworthy. Mrs. S was a foster mom as well, so she must know what she's doing. And, not much of a shock, she does. Felix and Mrs. S get Gracie comfortable by plying her with a combination of needling sass and motherly comfort. Since Gracie's mum isn't exactly the warm hugging type, Gracie virtually melts into S's arms. Well, mostly. S shares a really touching story (that might even be true) about how she got married young and lost her husband - a story which we find even Felix didn't know - and it puts Gracie at ease. But young Gracie still wants to sow her wild oats. She did just escape from a religious cult after all, and she wants alcohol and dancing! Mostly, as far as I can tell, she wants desperately to forget about the mess that is her marriage and the trauma of her forced pregnancy and then sudden miscarriage. But Mrs. S has good words for this too. 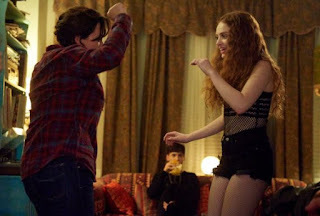 Instead of letting Gracie go out and get in trouble, they give her alcohol in the house, have a rollicking dance party to Mrs. S' punk records, and generally are adorable. There are dancing lessons, and Gracie admits quietly that she was kind of relieved to lose the baby. Not a shock, but I'm glad she was able to say it out loud. The fun ends abruptly, though, when Gracie collapses in agony and Felix calls 911. The paramedics who rush to the scene can't figure out what's wrong, but we do see that her eyes are completely bloodshot. You know who else's eyes are completely bloodshot? The woman who Seth and Rudy raped in the first episode. She's "been sick recently" and when Art goes to interview her again we find that she's not doing so well. So presumably this has something to do with those log books and with the secret research that Dr. Coady is conducting. Gracie is in trouble. Also Paul goes back to Arlington and gives his boss a copy of Parsons' log book with the request that he investigate Dr. Coady and figure out what's going on. So it seems that Paul isn't just a tool going along with orders here. Good. And then, in unimportant storyline news, Cosima is going on a date! She's been convinced finally that it's time to get over Delphine, so she lets Felix talk her into going on a date off of lesbian Tinder. 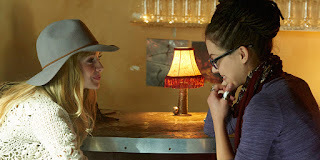 The date, Shay, shows up and is immediately charming and pretty and fun and Cosima is a dork and it's all very cute but kind of really distracting. At this point in the season I could give two craps about Cosima's love life. I'm glad Shay is nice and all, but I'm still rooting for Delphine to get her crap together, and plus she just seems weirdly suspicious. Still, Shay is a holistic healer and she gives Cosima a massage and there's some cute. Mostly, though, it's a romantic comedy stuck into the middle of a military drama, so it feels out of place. Alison and Donnie and their continued drug escapades don't really make any inroads this episode, being completely left out. And that's actually fine with me. Alison might be my favorite clone (she's so ridiculous and I love it), but this episode already had enough going on, and frankly adding in the Hendrix weirdness would have just confused matters. But overall I have to say that I really liked this episode. Not that I really dislike any of the episodes, but I do think that this season has needed more time than any of the others to really get going. Which is fine. By season three I think they've earned the benefit of the doubt from me in terms of letting the writers set up their world before they start crashing things together. It was a slow start, but now things are getting real and crazy, which is great. So I'm satisfied. I'll also sort of end this recap with a word about Felix. Because this episode wasn't particularly unified in theme, but the season theme of expanding family held true. Gracie becomes part of the Leda flock while Paul looks like he might return to the fold. The family keeps getting bigger and bigger, and there's a sense in which Felix, out of all the characters, seems most happy about this. I doubt it was ever a conscious thought to him, but Felix revels in having all these sisters. Seriously. He's off setting up dates for Cosima and counseling her about her love life, he's egging Alison on in her weird suburban life, he's worrying about Sarah and where she's got off to, he's even really invested in Helena in a weird way. And now he has Gracie too, another little sister to fret over, and it's just really sweet. I like that Felix's story in the show really seems to be that of a man who desperately wanted his family to need him like he needs them, and who is really getting that wish. Because Sarah, for all that she loves him, has never needed Felix. So this fills a hole in him I'm not sure he knew he had, and I love that. That's all for today, but tune in on Wednesday (hopefully) for the next installment of the Orphan Black epic recap catchup challenge! Paul, who is now back from Arlington, is furious about this. He made the deal, after all, to keep Sarah safe. Safe really doesn't mean in the clutches of a paramilitary organization that is rapidly going off the rails. And Paul really thought this deal would be honoured? That Castor would pass up the chance to get hold of both fertile Leda clones? Helena is feral, a kicked dog of a woman, and she is pregnant. She's got to think about her baby. Yes, we know that Sarah would go to hell and back for Helena and her child now, but Helena doesn't. Maybe Art passes out cards with his home address on them that say "Are you a curly-haired lunatic escaping from a religious cult? Come to Art for help!" I like the image. But in fairness she would know who he was from his time watching the ranch, and his name would be in the phone book. Gracie admits quietly that she was kind of relieved to lose the baby. Not a shock, but I'm glad she was able to say it out loud. This is brilliant. To go along with Helena's assertion that Gracie shouldn't have her baby if she doesn't want it. So few shows validate either of these feelings. Paul is adorable and kind of dumb sometimes. Oh Paul. I mean, yes, it does totally make sense that Gracie could find Art with only minimal digging, but I still like my headcanon. Yes! I love that they don't waste time making Gracie feel bad about losing an unwanted pregnancy. In a lot of ways, I think Gracie views all of this as a blessing and a kind of salvation. She can feel conflicted about it, and the show lets her. So needed. Art and his cards is a wonderful image, no argument. Even more so, in that I could totally see Felix suggesting he should start doing it. An unwanted pregnancy fathered by Gracie's own father no less, blech. Still, she's traded up in family now.